May God grant you always a sunbeam to warm you, a moonbeam to charm you, a sheltering Angel so nothing can harm you. 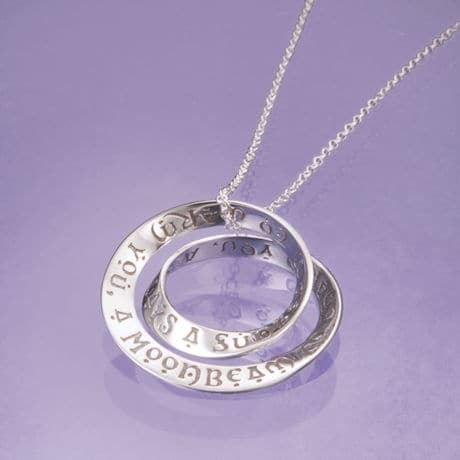 The traditional Irish poesy engraved on our sterling silver or 14k gold Irish Blessing Double Mobius Necklace is as cozy, happy, and comforting as a big friendly hug. 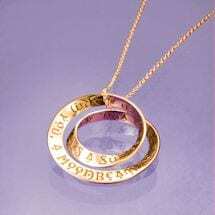 The undulating shape of the (about 1" in diameter) pendant - a geometric Mobius strip with a double twist - is seemingly infinite and utterly beautiful. Cast in the ancient lost-wax method and hanging from a simple 18" chain, this joyful piece adds a graceful touch to any ensemble.